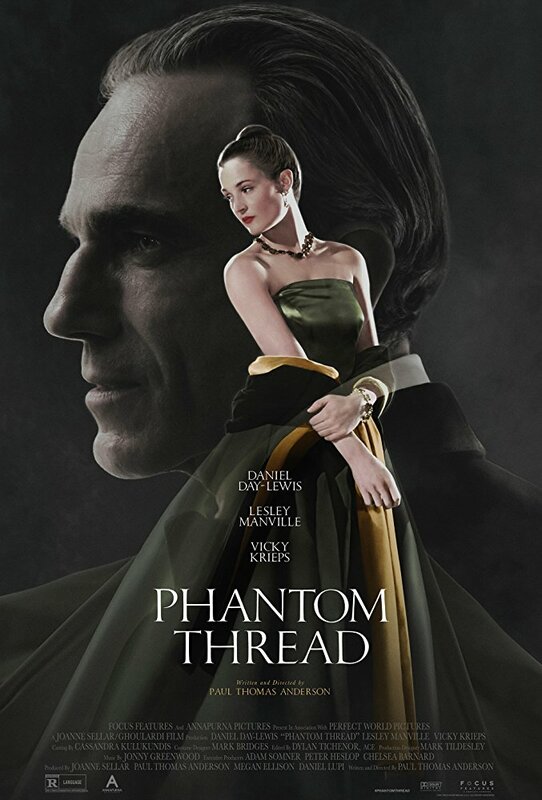 Something about Phantom Thread simply fascinates. As carefully constructed in its reckless romanticism as Hitchcock’s’ 1940 Best Picture winner Rebecca, itself a pristine and unforgettable adaptation of my favorite Daphne du Maurier novel, the film also channels the emblematic horrors of the mother/son relationship in his 1960 masterwork Psycho. Structurally, the narrative most resembles Rebecca, while the tone of the film almost feels more like Psycho with the morose and moody mystery atmosphere exchanged for a playful pageantry and the occasional predictable contingency. It’s a clever combination, begging us to court a beautiful looking film that, for the most part, shuns the concept of love in favor of infatuation. Phantom Thread is as inspired as in its approach as it is original. You don’t mess with a staunch artist’s routine. Reynolds Woodcock (Daniel Day-Lewis), a dressmaker who’d cringe at the simplicity of that job description, begins his days in the same patterned methods of American Psycho’s deranged killer Patrick Bateman, although far less sociopathic. Clipping nose hairs, a clean shave, the salt and pepper mop on his head perfectly slicked back. The House of Woodcock is a reputable one, the kind of place where royals and affluent members still thriving in a 1950’s London full of post-war posterity come not just to be fitted for a gown, but to encourage their own elitism. When a pretty young woman interrupts Reynolds’ dinner out to say that she dreams of being buried in one of his dresses, he merely smiles in fake gratitude, his eyes doing all of the talking: “I’d never make a dress for someone like you.” Reynolds abhors confrontations, and perhaps loathes unwelcome irritations even more. The slightest annoyance drums through his one-track mind like nails on a chalkboard. Enigmatic and preposterously controlling, Reynolds’ world is governed by women. Cyril (Lesley Manville), his Sister, manages the day-to-day of their high fashion empire. Their late Mother haunts the few empty spaces of his mind, omnipresent in everything he does. When we find out how he carries her with him at all times, the revelation is bizarre and oddly boyish. Then comes Alma (Vicky Krieps), a clumsy waitress in the countryside who looks at Reynolds and appears to appreciate the scrupulous, lingering gaze he dials in on her. The impenetrable career bachelor likes her looks, loves to test her, and admires her initial perseverance before it becomes distracting. Over the course of Phantom Thread, the muse evolves from solely being a source of inspiration to a co-collaborator and a co-conspirator in the great, demanding absurdity that comes with requited love. Reynolds chooses to dress this peculiar woman, and she allows his hands to navigate the lines of her body, the two of them performing their own exacting measurements on the other. By those standards, Phantom Thread is a compelling, complicated, confusing depiction of what it means to surrender to or assert complete control in a strict dichotomy of a relationship. It’s hilarious to me that the last film I saw before finally catching Phantom Thread was the softcore and impotent Fifty Shades Freed, a pop culture piece of trash that’s bested in sexual tension by a simple dress fitting in director Paul Thomas Anderson’s latest provocation. Personally, what I admire most about PTA’s work is that he refuses to reconcile the expectations of his audience with his stubborn and infantile inclination to do the exact opposite. However, here the virtuoso has tempered his unpredictability, loosening the corset so as to breathe a bit more to match inhales with exhales. 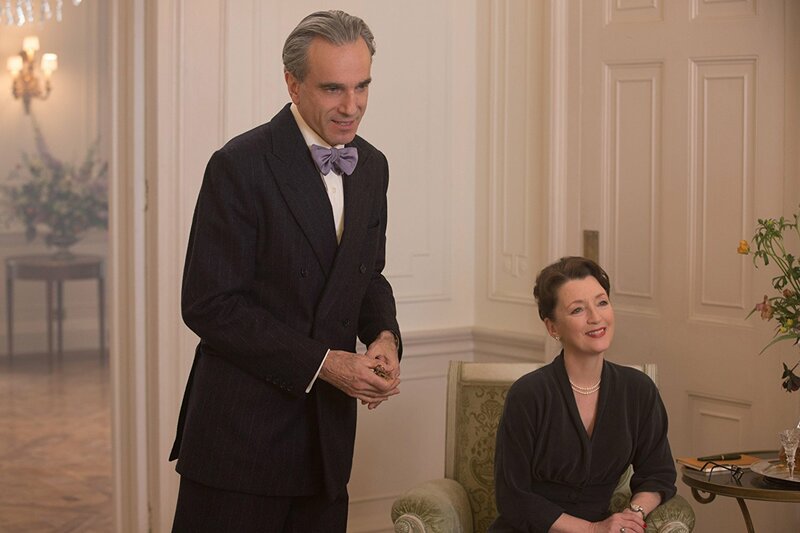 Featuring a stone-cold and fiercely determined performance from Vicky Krieps and another meticulous inhabitation by Daniel Day-Lewis (if this truly is his last acting gig, what a swan song to sail towards the sun and be buried at sea for the living legend), Phantom Thread equivocates its intrinsic desires through nuanced acting, a quietly ticklish script, Mark Bridges’ arresting costuming, and the gallantry of Jonny Greenwood’s prepossessing score. PTA’s newest film is a familiar drink spiked with the bitter twist of a lemon rind, and the type of technical achievement with a sickening story worth kissing, sleeping with, and heading to the infirmary for. It feels that wrong and that right. 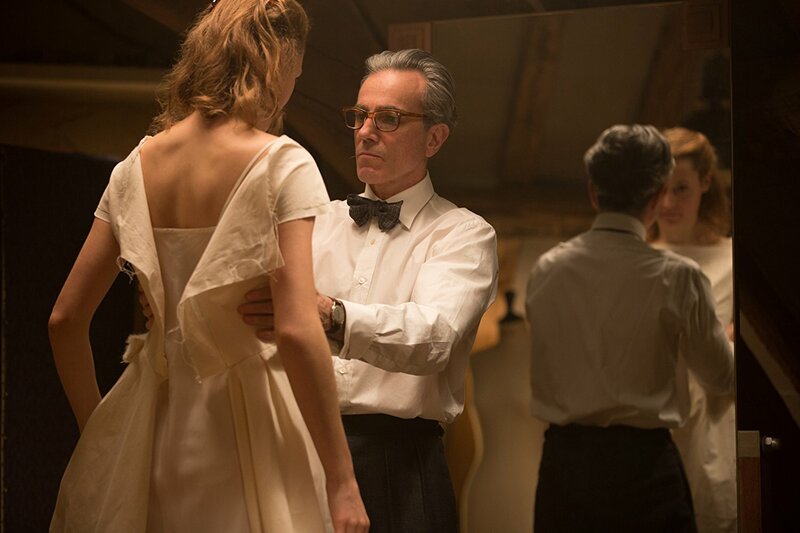 Phantom Thread isn’t a one size fits all crowd-pleaser, nor should it be, and I imagine most can at least adore the way it drapes such a combative story over such a willing mannequin. We look on in admiration, scouring away at a story that’s prickly and calloused, picking up on intermittent and integral details along the way (a split-second shot of Reynold’s scarred, scabby, dried thumb shows his longevity and the abrupt handheld camerawork invites unease into a controlled atmosphere). Then, come closing time, as the story has been gradually reiterating the themes of Edgar Allen Poe’s The Fall of the House of Usher, we get a hopeful shock to the system by way of a personal secret made literal and tangible. Phantom Thread might feel like another period piece bleeding with gothic tones and fashionable dressings, but if anything it’s a film that allows itself to value and highlight the beautiful and the benign, elegantly mixing the on-screen actions with the adjacency of a non-diegetic world that’s well within grasp and, somehow and someway, not always within reason. As we watch Reynolds dissect and critique every component of Alma’s being – a woman he chases and even loves – we realize that the film is about the artist’s headless pursuit of perfection. He sees flaws because he’s callow and shallow, as did I while watching Phantom Thread because I’m no different or better, all while I can stand back and call this feast for the eyes an equally engaging and thoroughly intellectual authority on the intense throes of passion. You walk away feeling as if you’ve been branded by the most elegant, legible, effiminate cursive known to man.